In a mysterious location, somewhere in the general area of Redding, California, a lazy portion of the Sacramento River flows elegantly through a seldom-seen maze of moss-covered river tiles. 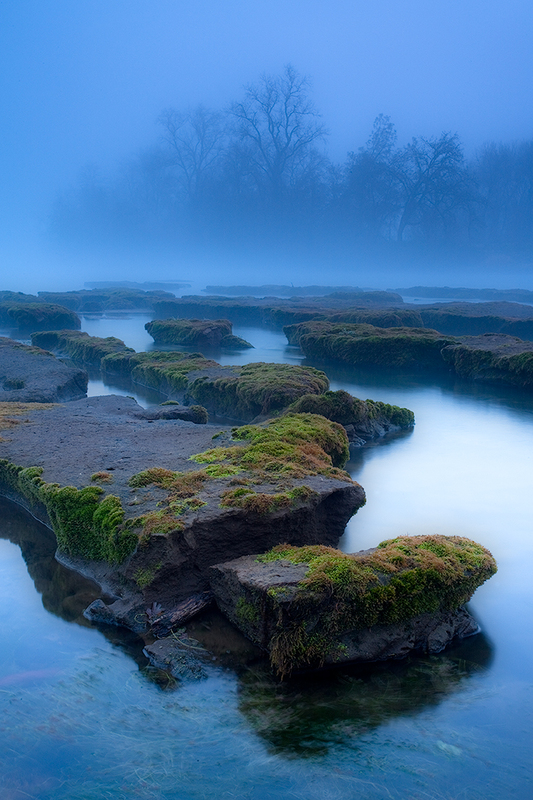 Legend has it that these rocks are only visible from time to time, when the water level is "just right." Affectionately nicknamed, The Furrows, this mystical, serene riverscape looks as though it could be set in mythical Brigadoon. Taken during a foggy sunrise, this enchanting photograph derives its color and atmosphere from the filtered light, low water level, light drizzly rain... and magical conditions.